The IPV6 capable R190W is ideal for cost-conscious service providers seeking a standard, entry level home router with cutting edge cloud management and robust features. The R190W can be remotely configured, monitored, and upgraded, and offers in-home client insights that make troubleshooting a breeze – all reducing the ISP’s need for site visits. Cloud-controlled cnPilot routers simplify ISP roll out of indoor home Wi-Fi. The router incorporates 3 additional functions in one package: Wi-Fi, an ATA to connect telephone and fax, and PoE out for powering up Cambium’s CPEs (subscriber modules). 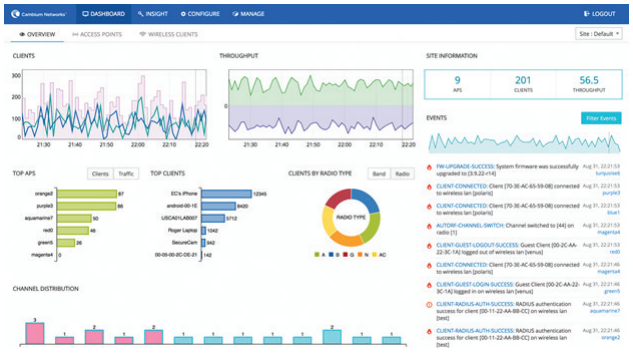 Remote secure management via cnMaestro controller features monitoring, configuration management, and integrated troubleshooting across Wi-Fi, client devices and Cambium backhaul (when present), reducing the total cost of network ownership (TCO). Flexible architecture lets you manage the network the way you want. Modules can be remotely configured, monitored, and upgraded. It’s estimated that over 60% of customer complaint calls to service providers (SPs) for “poor internet service” result from unmanaged home routers, purchased and deployed by end customers themselves. Enhance customer satisfaction by offering standardized SP- validated and managed indoor home routers that connect users to the internet rapidly and efficiently. 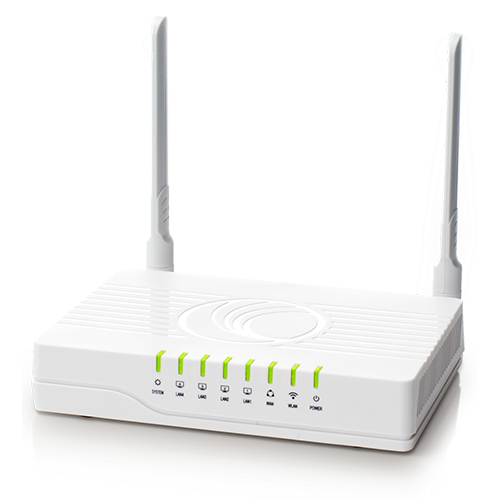 Sell or lease the R190W as the ISP provided router to subscribers, creating a new line of revenue. The low capex of these routers ensures a rapid return on investment. Reduce service call costs with client visibility via cnMaestro with the ezView tool. Track and manage customer inventory, and see attached clients and RSSI information remotely – enabling fast customer support. With ezView, cnMaestro offers rich client and device troubleshooting capabilities integrated with ongoing management. When backhauled wirelessly, ezView’s single-pane-of-glass display shows data from clients, the Wi-Fi router (R190W), and the ePMP or PMP 450 wireless links backhauling the router. Single dashboard view and rich statistics ensure rapid root cause detection and issue resolution. Enables service providers to offer SSIDs across their network as users travel from home, to outdoor public hotspot and to local business / small enterprise or campus. This allows network operators to promote their brand throughout their customers’ daily journeys. A variety of access architectures have evolved over two decades of increasing Wi-Fi use within organizations. Some have been driven by product limitations; others have been created to meet security or regulatory requirements. Management – Will the operation benefit more from a cloud-based or on-premises management system? Traffic separation – Are the organization’s requirements best served by local breakout of Wi-Fi traffic, or the extra separation of traffic made possible by tunneling user data to a controller? Many vendors’ solutions lock administrators in to a particular deployment model or network traffic distribution system, but Cambium Networks believes that Wi-Fi network design should conform to the organization’s needs, not the other way around. Cambium Networks cnPilot’s Adaptive Wi-Fi architecture enables Wi-Fi integration with existing wired network infrastructure and the cnMaestro™ management system provides scalable, flexible management in addition to Wi-Fi controller features. Where does your user data traffic go? The Wi-Fi AP can bridge it onto Ethernet (also known as local break out). Another option is to tunnel it over an IP-based protocol to a tunnel terminator, which can be a wireless controller or a different third party concentrator. Where does your Wi-Fi controller and management system run? Some organizations prefer the convenience of a vendor operated cloud-based management system. Others prefer in-house operation – usually with controllers that can manage tens of thousands of access points. For very small deployments, it can make most sense to configure an AP to perform the duties of a controller. Regardless of your requirements, cnPilot and cnMaestro offer customizable options for a complete Wi-Fi solution that meets your needs. Zero-touch deployment and Cloud-based management lets you easily deploy and control even large networks without requiring an IT team. Cambium operates cnMaestro™ in the cloud, scaling easily to thousands of devices – at no cost to you. The Cambium cloud is a highly redundant system with servers across the globe to ensure high uptime, with a secure HTTPS channel dedicated to communication between Wi-Fi APs and the cloud. cnMaestro™ advanced controller features include scalable guest access and remote login, allowing you to access your management console from anywhere in the world without having to VPN into your organization’s internal network. Organizations may choose on-premises management for a variety of reasons. Regulatory or security requirements, or simply preference for in-house management solutions may limit cloud-based control capability. cnMaestro on-premises management is perfect for such organizations, providing the same set of features as cnMaestro cloud management in a virtual appliance package. cnMaestro on-premises can also terminate data traffic tunneled from cnPilot APs over a tunnel and bridge it out over an isolated VLAN. This is useful if, for instance, you never want to bridge guest traffic at the edge of your internal network. For very small deployments that will not use cloud-based management, cnMaestro on-premises may be impractical for just a few APs. In that case, cnPilot Autopilot lets you designate and configure a master AP to perform double duty as a wireless controller for up to 32 other APs in addition to providing normal Wi-Fi service. 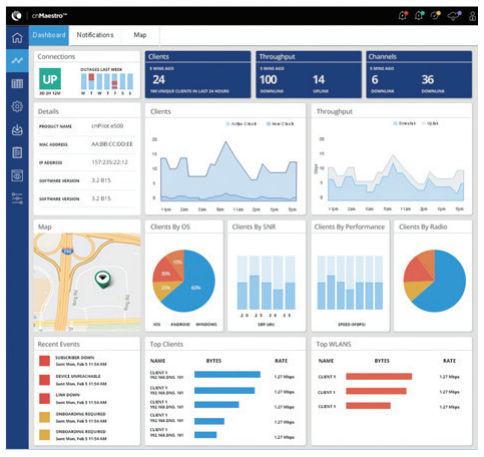 All monitoring and configuration can be done from the master AP’s UI. cnPilot and cnMaestro solutions from Cambium Networks make it easy for network administrators to design reliable, efficient connectivity solutions that scale and migrate easily to other architectures according to demand.